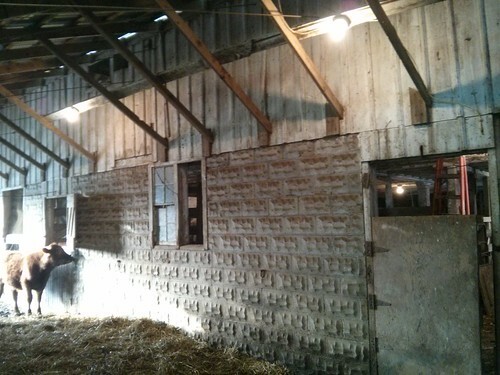 Little by little we’re making our barn into a better place to work. 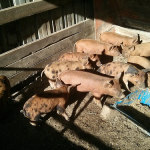 We’ve put up enough gates and doors to make it possible to work cattle and pigs inside, but there was one lingering problem. A problem that becomes quite evident every year in the dark days of winter. There just isn’t enough light! 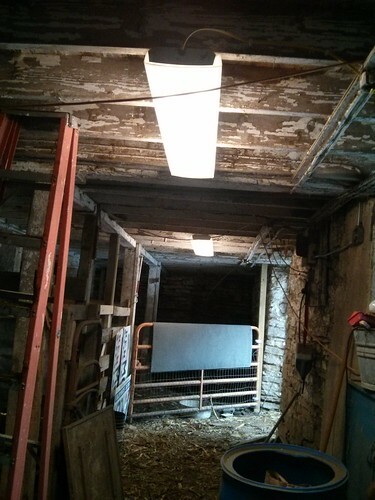 As it turns out, a 50′ x 50′ structure needs more than four 60-watt light bulbs. 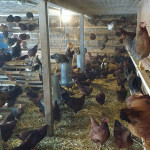 More light helps the critters see where they’re going, which means they’ll be calmer when they’re being moved around the barn. We pretty firmly believe that calm animals taste better, so better light equals better beef! 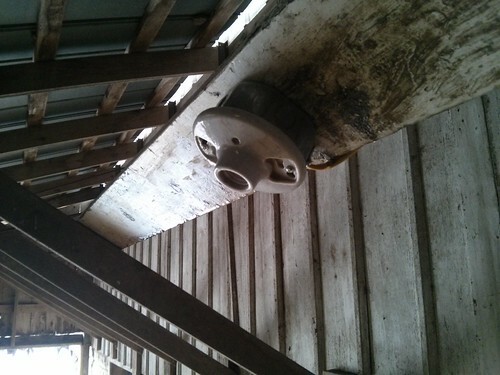 In that spirit we installed three big fluorescent fixtures in the “alleyways” of the barn where we frequently move animals through. And they’re T8 fixtures to boot, so more light with less energy! Out in the “lean-to” on the side of the barn the light situation was pretty dire. One 100w bulb for the entire space. That usually means that the cows balk at the mere mention of going in the barn. Being prey animals, cows have a pretty strong desire to stay out of crowded spaces where they can’t see well. Heck, if my Auroch ancestors had been hunted for eons, I’m pretty sure I’d prefer wide-open well-lit places too.